Hailed as “this generation’s First Lady of Jazz,” Nicole Henry possesses a potent combination of dynamic vocal abilities, impeccable phrasing, and powerful emotional resonance. Who better to pay tribute to the original Great Ladies of Song than today’s leading lady? Join us as Nicole takes us on a journey through some of this century’s most iconic female jazz singers, including Billie Holiday, Ella Fitzgerald, Sarah Vaughan, Dinah Washington, Nancy Wilson, Aretha Franklin, Nina Simone and Whitney Houston. 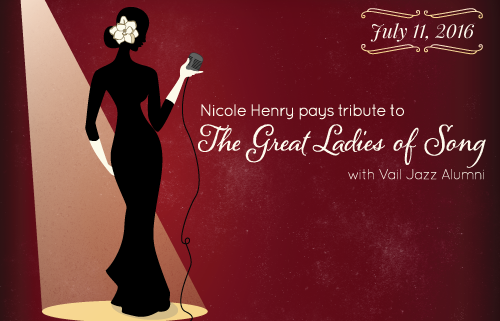 Nicole will be joined by Vail Jazz Alumni, who took part in the Vail Jazz Workshop. The truly unique evening will include an exclusive high-end auction, elegant three course dinner and an exceptional performance. This event benefits Vail Jazz educational programs, which touch the lives of over 1,400 children each year.